We started Mr. Gumpy’s Motor Car off with a bang! We kept our Three Names farm-themed sensory bin with a red “motorcar” added. The kids really enjoyed this theme. 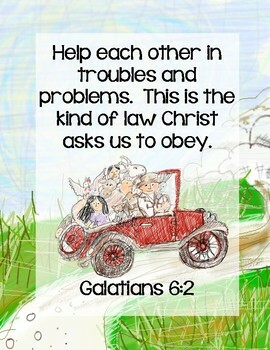 I created a Bible Verse Printable pack to go along with this book. You can purchase your copy here at our TPT Store. There’s a bonus FREEbie in the Preview. First, the boys traced their Bible verses. Next, we cut them apart like a puzzle and they added them to their lapbooks. Jordan even used playdough and our Bible verse poster page to practice the verse. We kept the Bible verse puzzle on Learning Lane to help memorize the verse. We read England on our Epic app and added the story disk to the United Kingdom. The boys added some UK lapbook inserts (Homeschool Share) to their lapbooks. I printed some of the extra pumpkin farm picture cards and used dry erase markers for a quick contraction match activity for Jordan. He paired the word groups with their matching contractions. 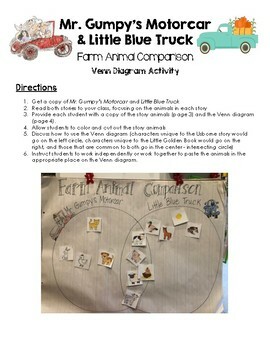 I created a Farm Animal Comparison Pack, comparing the animals from Little Blue Truck and Mr. Gumpy’s Motorcar using a Venn Diagram. I hid the farm animal cards all around the room and let the boys go on a “get the blood pumping – brain break” animal hunt! First, they recalled the animals in each story and placed them in the appropriate circle. At this point, I let them duplicate the animals (i.e. Little Blue and Mr. Gumpy both had cows, sheep, pigs, etc.). Next, I had them see what animals were both in Little Blue and Mr. Gumpy’s circles and place them in the center circle (i.e. where the two circles intersect). Afterwards, I added a Venn Diagram in their lapbooks and they worked on them independently. They used our flip chart for reference too! I added the animals in Mr. Gumpy’s Lapbook (Homeschool Share), wrote “letter blocks”, and gave them construction paper letters to spell out each animal name. The colorful letter blocks help make spelling a little more fun! The boys noticed every onomatoepia in the Little Blue Truck. It’s SO cool to hear them connect a grammar lesson to another activity we do! I sketched a quick worksheet to help Jordan skip count, multiply, and divide by the dozens. First, Jordan skip counted by twelves. Then he calculated each multiplication problem and ended with some division equations. We started our morning with a special farm breakfast. First, we had eggs, bacon, fruit, toast, butter, and a sheep pancake. We talked about their breakfast and which foods are from a farm. They talked about the products that came from animals, eggs coming from chickens, bacon (from pigs), toast and, butter from the cow. Then we talked about things that grown on a farm, fruit as well as the toast and pancakes come from wheat. The boys watched an animated Little Red Hen on our Mr. Gumpy’s playlist while they ate their breakfast. We brought out our Where Things Come From – Farm Cards (The Helpful Garden) and the boys sorted through the stack. First they matched up each item with the source card (i.e. cow, apple, corn, etc.). Then they placed them in order (i.e. from cotton to clothing). 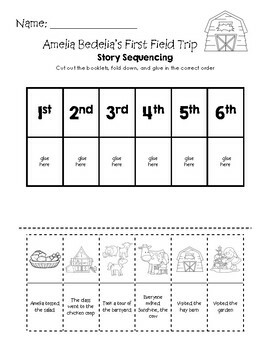 I created a story sequencing worksheet to go with Amelia Bedelia’s First Field Trip. This was the perfect book for our farm study. It covered animals and food grown on farms. After reading, the boys colored their worksheets. We went out to the garden to see what was growing in our boxes. The strawberries continue to grow throughout the summer and early fall. They’re sweet and SO beautiful. Jordan collected some cherry tomatoes and stopped to talk to the neighborhood kitty. We took a walk around the neighborhood and admired our neighbors apple trees. We hope to one day pick apples from our baby apple trees. Afterwards, they cut and pasted their story activities. They remembered the elements of the story. Great job boys! Since we were studying the weather, we started our morning with Jesus Calms the Storm from our Beginner’s Bible app. We also read The Rainy Day by Anna Milbourne. We LOVE her books! We brought out some others and I left them for the kids to peruse through! Bub LOVED the Usborne Weather book. We started our science lesson reading Why Do Tractors Have Such Big Tires? on our Epic app. We talked about friction and traction. Afterwards, we headed to the kitchen for some slip and slide lessons. After reading Little Blue Truck, we realized that it was the PERFECT storybook to compliment this row. I pre-cut Little Blue, the background, and set out supplies for our “mud in action” splatter art project. The boys worked on their art projects at different times. First they glued their Little Blue truck scene together. Next, they added their mud puddles. Using their brushes, they splattered the mud around giving the illusion of motion. They turned out awesome! We set them aside to dry. Later the boys added foam letters to spell out “Little Blue Truck” and a few stickers from our Little Blue Truck Farm Sticker Fun book. They did a great job making their Little Blue mud splatter art projects! As with our other rows, we created a Mr. Gumpy’s Motorcar playlist with read-alouds, music, science, and other animated clips. You can find most of the activities, ideas, and printables from this post on our Mr. Gumpy’s Motorcar Pinterest Board. Next > Apples, Apples, & FREEbies!